Why are flint and fire so important to ancient societies? Flint was of basic importance also on modern societies for the production and trade of gunflints, until the 19th century and threshing sledge inserts for agricultural instruments until some 40-30 years ago. Nothing strange. During prehistory, Bronze Age included, flint or chert is the commonest available raw material in many regions of the world. It was easy to obtain and ideal for flaking and make any kind of tool. At some Bronze Age societies it was more commonly used that metal for making drills for example, but also other kind of tools, like sickles. This question would need and encyclopedia to be answered in detail. Basically, fire allows to cook food and boil water, thus sterilizing them and making them better digestible. Moreover, fire can sometime transform the structure of materials making them more resistant and water proofing as in the case of bricks and pottery. Flint can be worked quite easily to create a variety of cutting tools. 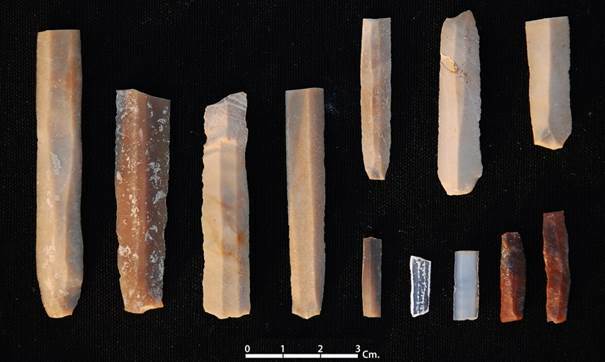 Above: Lithic blades from Shikarpur, courtesy Journal of Lithic Studies. Paolo Biagi's many articles on this subject offer an excellent introduction to flint in the ancient Indus region.